Dr. Martin Luther King Jr. so wisely said,“Everybody can be great...because anybody can serve. You don't have to have a college degree to serve. You don't have to make your subject and verb agree to serve. You only need a heart full of grace. A soul generated by love.” This Monday, January 21, we’ll gather to honor the legacy of Dr. King and invite you to join us in celebrating his life and work in a day of service. We’ve partnered with UNC Asheville and Mission Health to facilitate a morning focused in volunteerism, offering 14 service projects throughout Asheville and Buncombe County. To answer what Dr. King posed as “life’s most persistent and urgent question: What are you doing for others,” we’re hoping our fellow community members join us in making it a day on, not a day off. We’ll kick off the day together at 7:15 a.m. with breakfast at UNC Asheville, where attendees will receive MLK Partnership for Change t-shirts, UNCA Chancellor Nancy Cable and Mission Health COO Jill Hoggard Greene will share an inspiring message honoring the legacy of Dr. King before moving into their respective service projects from 8:30-11:30 a.m. Interested in getting involved in a service project? Please see further details and information for registration with our volunteer center, Hands On Asheville-Buncombe, below. Mediation Center Clean Up: Help make The Mediation Center's Family Visitation area more inviting by helping to clean, decorate, and assist in other needed projects. The mission of the Mediation Center is to create opportunity from conflict. The Mediation center is a safe and neutral environment for people who are experiencing a conflict with families, friends, neighbors, co-workers, or within organizations. Learn more and volunteer to lend a helping hand. Green Opportunities Beautification Day: Assist Green Opportunities by touching up paint throughout the building, wiping down desks and chairs, helping with prep-work in the community garden (weather permitting), organizing the reading corner, and more. Green Opportunities (GO) offers a combination of technical training, life skills training, and support services to unemployed and underemployed residents of Asheville and Buncombe County. Their training and employment programs empower members to overcome both personal and systemic barriers to employment. Learn more about this volunteer opportunity and sign up to make it a day on and not a day off. Help Restore the YMI Cultural Center: Lend a helping hand at the YMI Cultural Center, the most celebrated African-American cultural institution in the region, which offers intriguing exhibitions, a VITA (volunteer income tax assistance) program, West African dance and drum classes and more. Volunteers will be doing some touch up painting and sorting/ cleaning in the YMI basement. Help beautify and preserve this cultural treasure. Clean + Create at Asheville Primary School: Help breathe new life into Asheville Primary School in a variety of ways. They’re in need of support in garden and playspace cleanup, spring garden prep, installation of garden signs and storage, painting and more. Asheville Primary School prepares children to be kind, proactive critical thinkers and problem solvers who positively impact their communities now and in the future. Learn more and be of service to them this MLK Day. Pet Food Drive for Brother Wolf Animal Rescue: Help encourage pet food and care item donations to Brother Wolf Animal Rescue at Petco and PetSmart in Asheville. Volunteers will take Brother Wolf's animal wish list and hand it out to customers, encouraging them to purchase food and other pet care items for donation. Learn more and lend a paw to help our local animals in need. Rathbun House Cleaning Project: Lend a hand helping with indoor cleaning projects at the Mission Rathbun House and support families coping with hospitalized loved ones. Make time to volunteer and register here. Day of Hope at the Christine Avery Learning Center: Help Learning Center students prepare for the MLK Peace March and Rally beginning at noon in downtown Asheville by practicing a song or chant, organizing how they will march, preparing materials and signs, and getting ready for the day’s event. This is an opportunity to work directly with young people as they process and work to understand the importance and significance of the day. Learn more and register to volunteer. Support YMCA’s Mobile Market: The Healthy Living Mobile Market (HLMM) is a vehicle used to expand the reach of the YMCA's free food distributions into surrounding communities. The Mobile Market distributes mostly produce as a way to encourage families to eat healthfully. They need help cleaning their hub and sorting through food that went bad over the weekend. Support this wonderful community project. Enka Middle School Winter Clean Project: Join us for a winter cleaning project at Enka Middle and help deep clean the student’s classrooms. This time of year, the cold and flu can prevent many students from coming to school and attendance is a key indicator for a student's success. If a student misses 18 days (or 10% of school) and there is no intervention, their likelihood of high school graduation drops to just 25%.Let's help keep the school clean and stop the spread of germs and limit those missed days! Come on out and support our students! Asheville Middle Clean Up: Come on out to Asheville Middle School and support students by deep cleaning the classrooms and sanitizing their indoor spaces. Register to lend a helping hand here. Help Build New Homes for Families in Need with Habitat for Humanity: Habitat for Humanity is dedicated to providing safe and affordable housing to residents of Buncombe County. Their neighborhoods are the most diverse in the county, and represent the gathering of cultures, races, backgrounds, and ages that Dr. King envisioned for our world. You’ll be expected onsite and ready by 8:15am, with the project will ending around 11:30 a.m. There are also projects inside the homes in the case of inclement weather. Help Habitat for Humanity and celebrate a Day of Service. YMCA Property Clean Up: Volunteers will work to beautify the YMCA child care center by mulching, helping with creek remediation, painting, and more. The YMCA of WNC is committed to strengthening the foundations of community through programming that supports youth development, healthy living, and social responsibility. Our programs nurture the greatness in every child, promote well-being throughout the community, and give back to our neighbors in need. Lend a helping hand to support their mission. Return to Burton Street with Hood Huggers International (Afternoon project): Join together with fellow Burton Street Community members and Hood Huggers to help with garden maintenance, mulching, trash pickup, library organization, art creation & maintenance, rebuilding historical markers and more. Hood Huggers offers sustainable strategies for building support pillars for resilient historically African American neighborhoods, providing a framework for community capacity building and maintaining while increasing the effectiveness of existing service programs. Register to support the Burton Street Community here. Please note that you do not need to be able to attend the breakfast at UNC Asheville in order to participate. All service projects will end in time for volunteers to join the Peace March & Rally, beginning at 11:30 a.m. at St. James AME Church before participants march down College Street to City-County Plaza for the rally. Attendees to the Peace March are also encouraged to bring non-perishable food items which will be donated to MANNA Foodbank. The annual Candlelight Service, is also being held in Central United Methodist Church’s Fellowship Hall, honoring area citizens and organizations that have dedicated themselves to the cause of social justice. 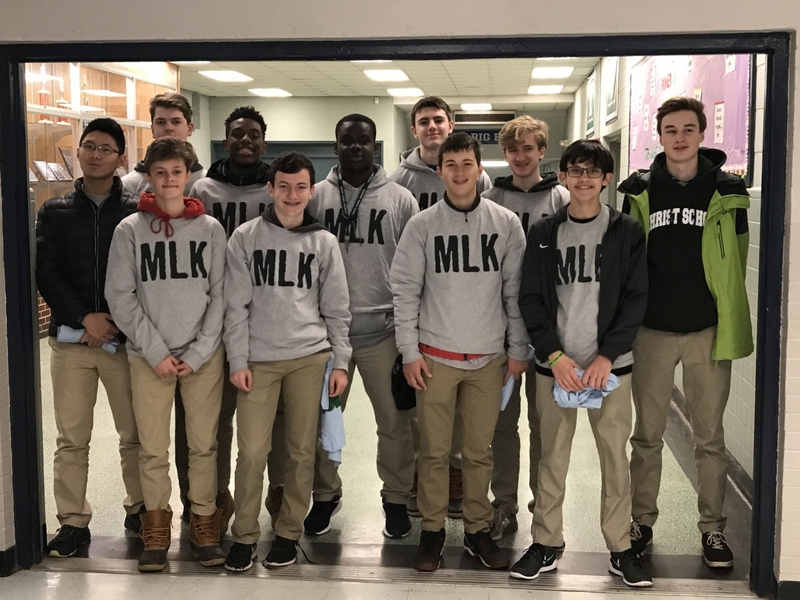 A group of students from Asheville School students are also hoping to engage and inspire the Asheville community by holding a recitation competition of Dr. King's enduring works. The competition is open to any student who wishes to enter will be held at the YMI Cultural Center of Asheville from 7 p.m. to 8 p.m.